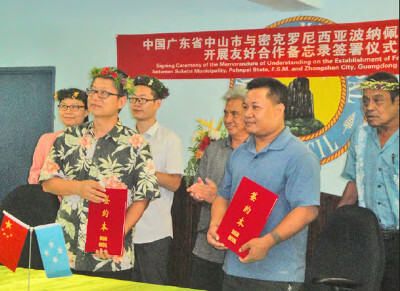 Pohnpei, FSM—The Sokehs Municipal Government and Zhongshan City of Guangdong Province of the People’s Republic of China signed a sister city agreement on August 15 at the Sokehs Municipal Chamber. The two Parties agreed to enhance reciprocal visits, strengthening mutual understanding and friendship as well as to seek common development and to facilitate exchange and cooperation in the sectors of tourism, culture, and business. Representing the Zhongshan City at the signing ceremony were the Vice Mayor Lei Yuelong, his Deputy Director, the Deputy Chief of Foreign affairs and the Deputy Directors of the Bureaus of Commerce and of Sports and Education. The representatives of the Sokehs Municipal Government were the Sokehs Chief Magistrate, the Speaker of Sokehs Municipal Council, Director of Sokehs Municipal Government Administration, and the Sokehs councilmen. Witnessing the ceremonial signing of the sister city agreement was his Honorable Marcello Peterson, Pohnpei State Governor. Chief magistrate of Sokehs Municipal Government, Michael Liemen said that they look forward to a successful and prosperous relationship with Zhongshan City. “We look forward to our people to people exchanges, and if in the future you have exchanges in the areas of sports and education, I do believe we have potential to offer in the sectors of economy, tourism, and culture. “Mayors and officials of our two governments will come and go but this relationship will continue to grow and will be celebrated and appreciated in the generations from today,” he said. The Vice Mayor of Zhongshan City Lei Yuelong said that the signing of the Memorandum of Understanding (MOU) on the establishment of friendly cooperation between the two Parties will allow for more Chinese to visit. Yuelong said that Zhongshan City has been recognized and awarded as a National Civilized City, National Historic and Cultural City and China’s Happiest City. 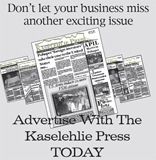 Liemen said that he is excited to be part of this historical accomplishment and will do his best to utilize the establishment of the new relationships memorialized on the day. He said that he hoped the signing wouldn’t be just a written agreement, but something that the people of both countries can celebrate and appreciate.